AS OF 10/12/08 there are still a few sets left. "The quality is terrific and the workmanship in your presentation is great. I understand the work that goes into making this set. I am often asked 'Why doesn't somebody start making card mounted stereo prints again, i.e. like Keystone, etc.' I explain to them how difficult and costly it is to make high quality prints (mounting alone is very time consuming). If Keystone was alive today they would sell their views for $10 each or more and their quality doesn't come up to the quality in your set. Theirs would be mass produced and your work is hands-on, one-of-kind craftsmanship. I feel this is a great investment for a young collector. I figure in 10-20 years some will look back and wish they had purchased it." I am pleased to report that The Bowery Mission in New York, a favorite charity of Brian's, is receiving 25% of the proceeds from the sale of this set of views. Brian had previously created a lithographic edition of 12 of these stereoviews, and that COMPLETELY SOLD OUT edition has already raised more than $5,000.00 for them. The sale of these newer, archival sets has already raised another $1,500.00 or so and will help raise an additional $1,500.00 or more for them, which will continue to help offset the $150,000.00 loss in donations that they have experienced since last year. Demands for the Mission's services are high, largely as a result of 9/11, so it is nice to be able to help this way. Hopefully we will have raised $10,000.00 or more by the time the various sets of stereoviews have all sold. For the past year and a half or so I have had the privilege of working with Brian's images in order to create the best possible, archival stereoviews from them. I have done this in order to share the best possible quality versions of these stereo images with others who may also be interested in keeping a 3D piece of this historic event for future generations. It is also a joy to know that The Bowery Mission is receiving donations from each and every set of these images that is being sold. "The set arrived, and they look great. I know how much work it is to do this right, and your experience is evident. I am pleased to be able to have a full set. The maps on the back are a nice touch. It does help quite a lot to understand what the orientation is. Reminiscent of the old Underwood map system, which I have always liked. This is an artifact for posterity. You are to be congratulated for your efforts, which in my case are well appreciated." "Great job! Wow - the whole affair is so professional, and the mounting is nothing short of perfect. Also, the back of the cards are so well realized and value-adding. I'm very impressed." "You did a great job on the 911 views. Very Pleased." "The cards are really great, and the box is wonderful. I'd put them in the category of the SF earthquake, '06. Collectibles to be sure." "We are very happy with the photos. You did a great job with them! Thank you for sending them so promptly. We both feel that we have a piece of history and are truly happy that we purchased them." Brian has also partnered with a third stereo photographer, David Eisenman, in order to offer sets of duplicate slides of 6 of his best images for those who prefer stereo slides. 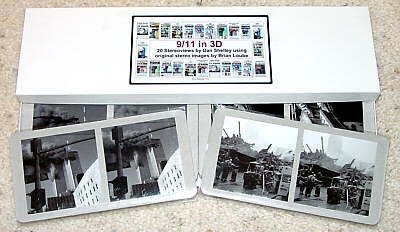 I (Dan Shelley) will be offering stereocards of the same 6 views, as well as a full set of 20 (see below). There will be 100 sets of the 6 stereocards available. These pairs will be mounted by me, using archival, museum quality, 4-ply board and archival glue. The finished cards will be protected in stiff protective sleeves from Russell Norton. Below are samples of cards 01 & 14 presenting the Front, Back and detail from the Back image all on one page. These stereocards will be made with the same care and materials as the 100 sets of 6 stereocards. A specially designed archival storage box may also be offered as an addition to this set of views.